PK-168 NEXTpro S2/W #1 smart remote identifier. PK--168P NEXTpro S2/W #1 remote and PoE detector. PK-168 R2-8 Smart remote identifier #2 - #8. PK-168 R2-25 Smart remote identifier #2 - #25. PK-168 SR 2-8 mini map/ID adapters #2 - #8. PK-168 SR 2-25 mini map/ID adapters #2 - #25. PK-168P: Remote unit come with PoE detector. It detects presence of PoE and displays type of PoE either end-span A or mid-span B or ultra power over 4 pairs and either 802.3af (PoE) or 802.3at (PoE+) is present. 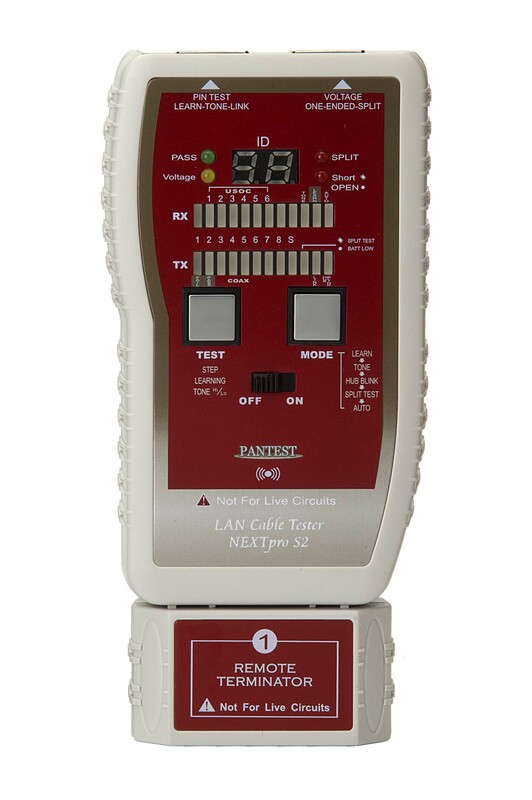 (A) Provides Telecom, Datacom and cable installers and technicians with NEXTpro S2 includes both pin by pin continuity test and split pairs (wrong twisted pairs) detection for testing Lan cable via one-ended (no remote) testing finds split pairs, opens or shorts. (B) The unit utilizes decoding technology to display RX (far end) pinout with TX (near end) and cable ID on the main unit on remote testing to support a full range of Data, Voice and video applications. (C) It also features a Learn/Quick test mode with memory capacity for testing quantity standard or custom cables for Pass/Fail a snap, they've been able to speed it's testing time. (D) Hub Blink and Toning modes allow to trace both active and inactive cables, display of the Ethernet port to which the test cable is connected, and identify unknow RJ45 outlet for active Ethernet. 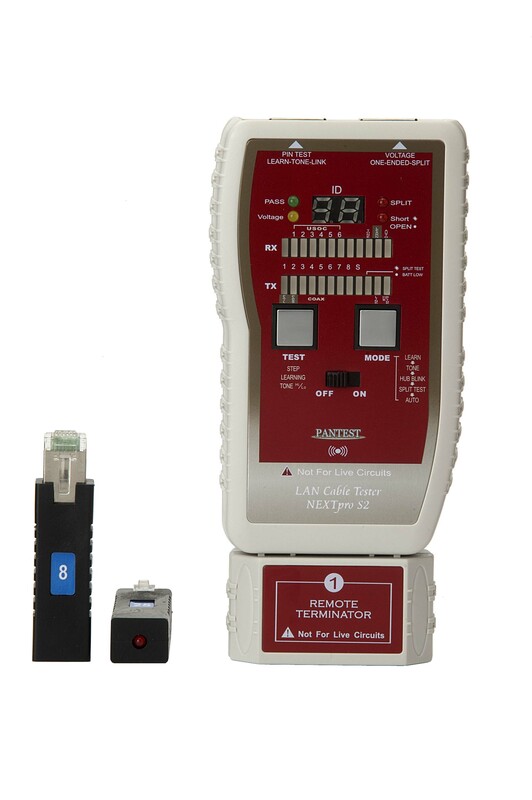 Includes a link indicator for identifying cable termination on active network ports. In tone mode, output two powerful tones for tracing & loacting active network cables on a switch or hub, for use with Net Probe(PR-06P) for cable tracing. (E) The unit includes a large remote mapping capability to support up to 99 IDs remote identifiers to serve larger installations improving efficiency. This allows the installer to test and check the ID number of up to 99 networks or patch panel outlets in one step without labeling the cable manually. In Learn mode, when the main unit detect the corresponding connection point, the main unit displays pass or fail a snap and the IDs number on digital LED display, and far end IDs LED light on simultaneously. 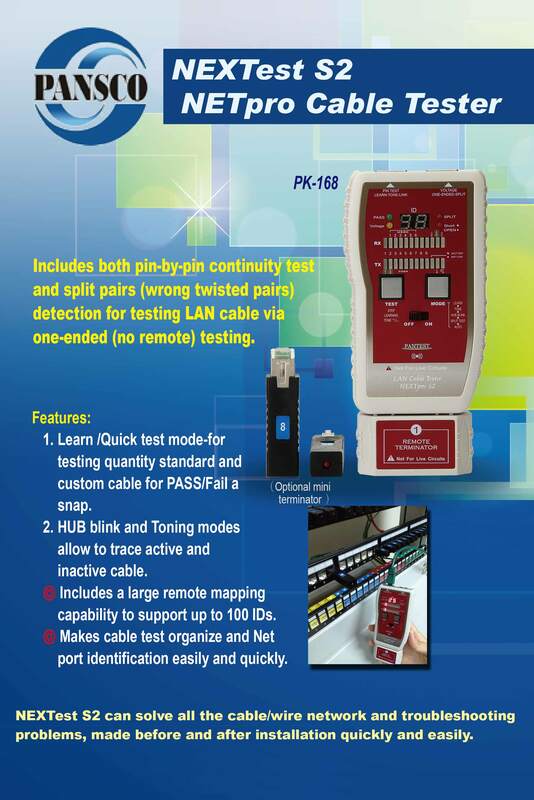 This makes cable test, organize and port identification easily and quickly. NEXTpro S2 can solve all the Cable / Wire network and troubleshooting problems, made before and after installation quickly and easily. Optional mini remote map/ID adapters set with RJ45 plug for fitting patch panel jack that used to test and determine unknow cabling paths simultaneously by seeing which numbered plug is on the other end of the cable. PK-168 also with voltage detection and warning functions to protect the tester. 1. Provides clear pin by pin wire mapping and split pairs detection. 2. Tests for continuity and detects shorts, opens, miswires, reversals and wrong twisted pairs. 3. One-ended (no remote) testing of Lan cables for split pairs, opens and shorts. 4. Includes smart remote identifier for very accurate wiremap and ID results. 5. Learn/Quick test mode allows the production and installation to be checked quickly. 6. Transmits 2 selectable powerful tones for tracing inactive and active network cables on Switch or HUB. 7. 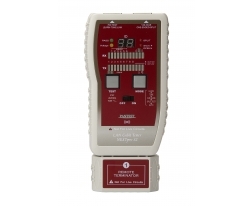 Voltage detection and warning to protect the tester, with battery-low indicator. 8. Optional smart wiremap /ID remote identifier #2 - #99 to serve large installations. 1. Blinks a link indicator to find a HUB or Switch port to confirm connected active configuration. 2. Quickly locate and identify unknow RJ45 outlet/port for active Ethernet. 3. Optional PK-168P, remote unit includes PoE detector. 4. Test to see if either 802.3af (PoE) or 802.3at (PoE+) is present. 5. Displays type of PoE either end-span A or mid-span B or ultra power over 4 pairs is found. Main Unit : Left side RJ45 jack for pin to pin testing, Learn, Tone and Net Link modes. : Right side RJ45 jack for split pair, and voltage testing. Split Pair/voltage: 3ψLED x 4 indicates pass, split pair, open, shot and voltage. Pin by Pin: 12 pins light bar x 2 TX, RX and MODE display. Auto/Step Scan, Learn/Quick test, Tone, Hub blink and split pair test. Wire mapping both by pin and pair, includes one-ended testing for cable for split pairs, opens and shorts. Full cable testing for opens shorts miswires, reversed. Voltage detection, learning for quick testing, output tones, as well as Hub blink. 600 HZ ↔ 1 KHZ, Alternating frequencies at two selectable tones. Voltage LED lit with buzzer sound to protect the tester. Standard and custom configuration cables, any category network, STP UTP, USOC, 2,4,6,8 and Coax cables. Tests for IEEE 802.3 af and IEEE 802.3 at (PoE+) compliant PoE. 10℃ to 90℃ non - condensing. Size: Main unit 2.8" x 4.8" x1.1"
Remote unit 2.3" x 1.2" x1.1"
Combined 2.8" x 5.9" x1.1"